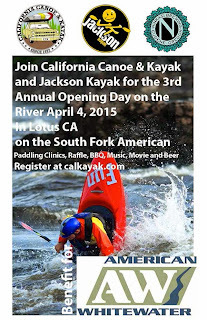 Join California Canoe & Kayak and Jackson Kayak for the 3rd Annual Opening Day Celebration. Special Thanks to our co-sponsor and friends at Ninkasi Brewing!!! CCK OPENING DAY!!! Proceeds to benefit American Whitewater and Bob Center Recovery Fund. If you plan to eat. ~ promise it will be good – Food donation $10 all proceeds go to AW. Would also like to thank all the CCK Staff for all the hard work they do to make this happen.